You know those days where you go into work feeling relaxed and hydrated but a few hours later, you feel the complete opposite?! 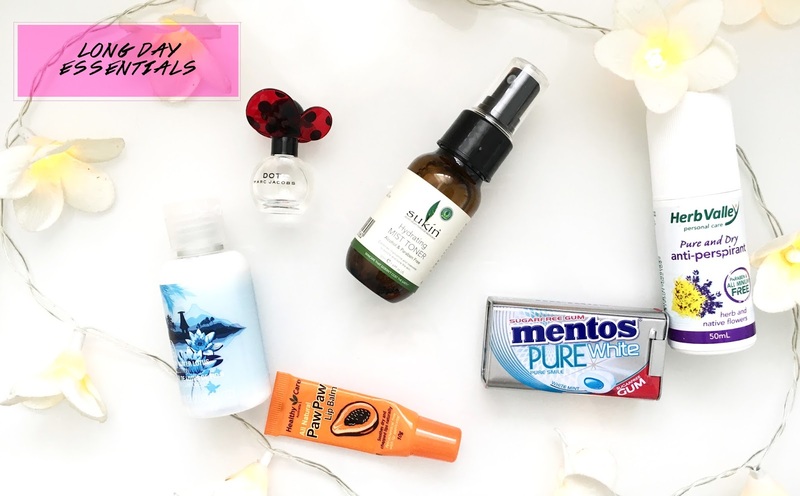 Whether it’s university, school, work or other places you spend your long tiring days at, I’ve got your back with some tips to survive those long days and get through it feeling refreshed and energised! When I’ve been inside an air conditioned environment for a few hours, my hands always seem to get dry. They get stretchy and feel super dry and uncomfortable. I love Body Shop’s mini lotions. Not only do you get to test out the fragrance before committing to the full size but they’re also super convenient to pop into your bag. My favourite has been Body Shop’s Fijian Water Lotus mini lotion. It’s very hydrating and light and smells super refreshing – perfect to keep you going! Now at my work you have to wear stockings with your skirt or dress. It’s just a rule they have and sometimes when it’s super hot out or if the aircon isn’t working, it can get pretty hot and sweaty. I love having my trusty Marc Jacob’s Mini Eau De Toilette in my bag as it’s super easy to take out and apply and plus, the fragrance lasts for a good few hours. Read my full review of Marc Jacob’s mini perfume set HERE! I’m usually not one for using a face mist at any time as I feel like they don’t work for me. However, recently, when I’m on my break from work, I always spritz Sukin’s Hydrating Mist Toner on my face before I go back in. The rose water and the chamomile in the mist are soothing and makes you feel relaxed while the mist itself tones and cools tired skin. The best thing about Sukin is that they don’t contain any parabens or sulfates or harsh chemicals so it’s much better for you! The smell is calming, relaxing, refreshing and uplifting. This is also great for those hot days and long flights! And it really does leave you feeling invigorated. Usually before I go into work, I apply my lip balm and then about thirty minutes in, my lips feel very dry. I think it’s super important to have some lip balm handy in your bag especially if the aircon has been cranked up high and you can feel your lips drying out. I’ve been loving the Healthy Care All Natural Lip Balm. I’ve got the big tube and because I liked it so much, I’ve purchased the little tube to pop into my bag. This lip balm is great because it leaves your lips feeling super moisturized after applying. However, I do have to say that the formula is quite sticky and does stay on your lips more like a gloss than a balm. Either way, I feel like it moisturizes my lips more because of that reason! Gum / mints are a must to feel refreshed. I carry a little tin of Mentos Pure White gum in my bag at all times. So when I’ve gone out to eat a burrito, I can pop one of these minty gums into my mouth and feel an instant dose of refreshment. The gum in the tins do however get annoying at times as the mentos starts to run around in the metal tin, making a loud noise every time you walk. Now this one I’m sure you’ve already got lying around in your bag. Everyone needs deodorant as they’re a quick way to feel refreshed. My favourite has been this Herb Valley Pure and Dry Anti-perspirant. This deodorant is aluminium and paraben free which makes much better for you and the scent is actually super soothing and refreshing! So I can’t actually find my mini hand sanitiser in the smell of Sweet Pea which is why it wasn’t included in the photos, but I just have to mention it because it smells soooo good! The one I have is the Palmolive Sweet Pea sanitiser. It’s not sticky at all and makes you feel clean and fresh and smelling fabulous. What are some of your long day essentials?